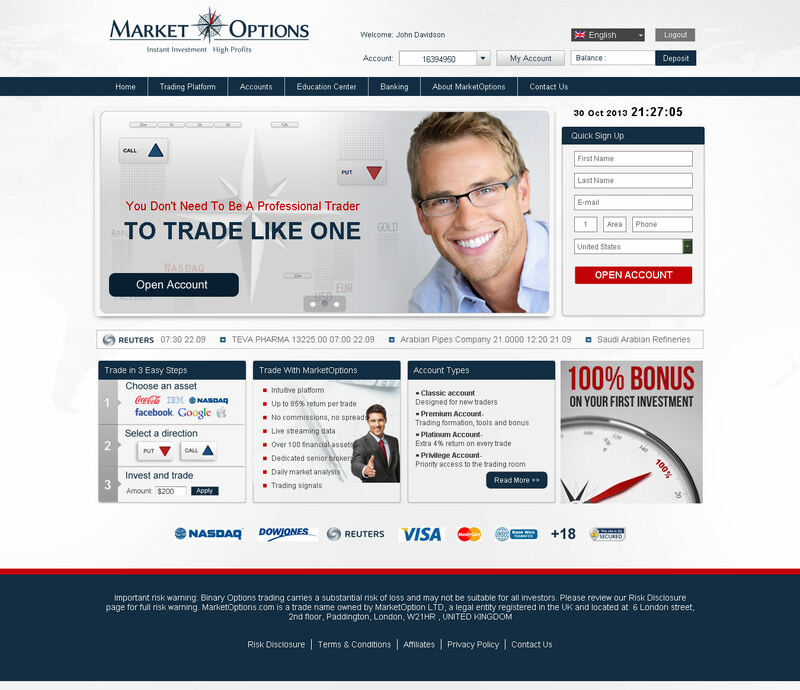 MarketOptions is no longer operating as a binary options broker. The review presented below is no longer applicable and is presented for archive purpose only. MarketOptions is a newer binary options broker, and there are a lot of information gaps regarding their site and services. The site is operated by a company called MarketOption LTD which is based in London, England. They have been offering binary options trading to retail customers around the globe since 2013, and appear to be in the middle of either building or revamping their website. As such, there are a lot of site sections which are missing outright. Live chat was not staffed, and there were also a number of load errors on different pages, as well as problems with the login screen. They do not appear to be ready to actually accept traders, but they are already offering trading on their site anyway. That said, here is a rundown of their existing features. First off, before you even deposit into an account, you will want to find all the information about doing so. This took some doing. I was unable to find an FAQ or a page about deposits and withdrawals at all at first. Finally, I was able to view cached versions of these pages after conducting a Google search. The current versions result in a 404 error. You can deposit or withdraw via credit or debit card, wire transfer, or CashU. There is a $25 fee for wire transfers, and no minimum thresholds mentioned for withdrawals. You can deposit only in US Dollars or Euros. Another page I had to dig for was the page listing the account tiers, which is here if you are searching for it. I didn’t actually find this page anywhere in the site links, but I did find a link to it from the company’s Facebook page, which was arguably more informative than the website in some respects. As you can see, there are four different account tiers, starting with the $200 minimum deposit Classic Account, which includes a 20% welcome bonus. The highest bonus listed is for the Platinum account, which is 75% on $5,000 or more. There is also a “Privilege Account” at the highest level, but no details are listed for this type of account. 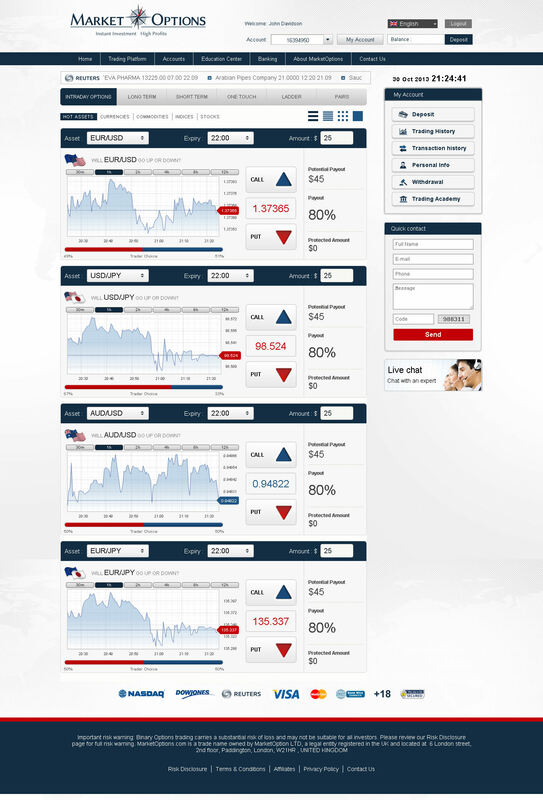 There was no asset index on the site, but the trade page reveals commodities, currencies, stocks and indices to trade, and if you search through third party reviews, you will find there are 58 assets to trade (some references state “over 100,” but this is vague and leaves much to interpretation). The minimum trade size is $5 for short term trades, and the maximum trade size (discovered on another cached page) is $1,000. About the only reason to consider a second look at this broker is the types of trades available. There are a pretty wide variety, including High/Low, Long Term, Short Term, One Touch, Ladder and Pairs. Ladder and Pairs are becoming much more common, but the Short and Long Term trades are noteworthy. This is one of the few brokers we have found which offers 30 second trades as well as 60 second trades. There are also 2 minute trades. The Long Term trades are very exciting. The majority of binary options websites are catering to intraday traders only. Some of the long term trades extend for weeks, which is excellent for position traders, who are otherwise left out entirely. Another feature of the site which was actually kind of promising was the education area. While the site is lacking in a basic FAQ, which would have been really helpful as far as getting to know the site and services, there is a large selection of training videos which are available for free, as well as a trading eBook. The videos cover beginner topics as well as advanced topics, including some trading strategies. Additional trading features include double up, rollover, sell (early close), daily signals and financial analysis. The signals and analysis are only available for higher tier members. The first problem I noticed with the site was how many pages of information were outright missing—basic pages I would expect to find on any binary options website. Having to search for cached versions of these pages was irritating, and more trouble than most binary options traders would want to go to just to get basic info. It would be helpful if the site had a notice that at least stated, “Under construction. Adding new sections and features.” Acting like the site is already done when it has obvious problems is a red flag, and raises some questions: What other problems could you expect from a technical point of view, and is the site responsible if you lose money because of their errors? There were also problems with dialogue boxes and error messages which came up when I tried to use certain login pages. The login boxes at the top of the page still worked, but this was yet another problematic aspect of the site design. Hoping that a customer service agent could shed some light on these problems and also assist me with finding the missing information, I tried to reach someone on live chat. Despite attempting to do so during standard business hours, nobody was there, and I was immediately directed to send an email. I don’t want to say that this is a terrible broker and they should be avoided at all costs, because they may well have good intentions. Regardless, they are failing not only with their website but also their communication. Maybe it is worth it to check in with them again in six months, but probably not. Their website may very well still be undergoing construction in parts, but the fact that they are offering service on a site that barely functions is dodgy, as is their lack of acknowledgement. The only compelling features they are offering are long term trades and a variety of other trade types. Because all the drawbacks seem to outweigh the unique benefits of this site, it seems best to avoid MarketOptions.